The Roland BK7-M Midi Expander is the very latest accordion expander from Roland, suitable for all midi & digital accordions including the Roland V Accordion series. A full array of fantastic sounds & rhythms in a small, lightweight and easy to operate box. Please contact our Rochdale shop for additional details. Comes complete with a three year component part manufacturers guarantee from Roland UK. Visit www.roland.co.uk or phone our Rochdale branch on 01706 658283 for full details and specifications. Phone our Rochdale branch on 01706 658283 to purchase this Roland BX7-M Accordion Midi Expander. Don’t forget, free delivery to to most parts of mainland UK is included! 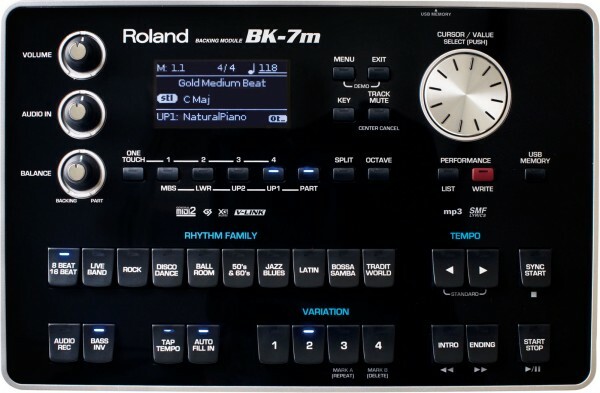 A 0% interest free loan is available on this Roland BK7-M Midi Expander subject to status via the Arts Council. Terms and conditions apply – please contact us for full details. Complete a full three year component parts guarantee. Don’t forget, free delivery of this Roland BK7-M Midi Expander to most parts of mainland UK is included!